Laminate flooring is chosen by more and more homeowners. That’s because it can simulate wood without having the same requirements for maintenance and cleaning. The easier process of installation makes it a better choice for small renovations in rooms that need a change. The visuals and colors make them look like a valid replica of natural wood or stone. Keep on reading to find out our suggestions for bathroom laminate flooring ideas from our collection. 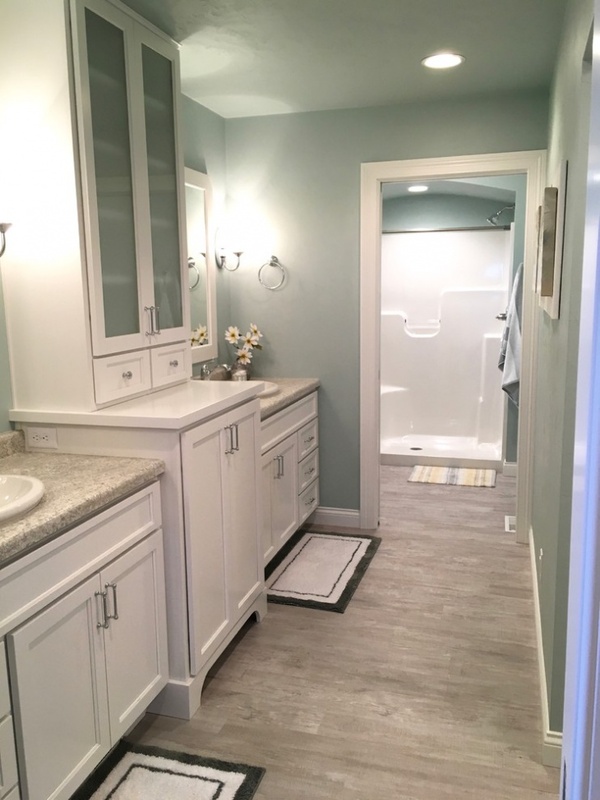 This farmhouse bathroom uses light gray laminate flooring. The look of worn wood gives a hard and edgy feeling to the room that matches with the metallic casing of the tube. The laminate planks create an interesting pattern. 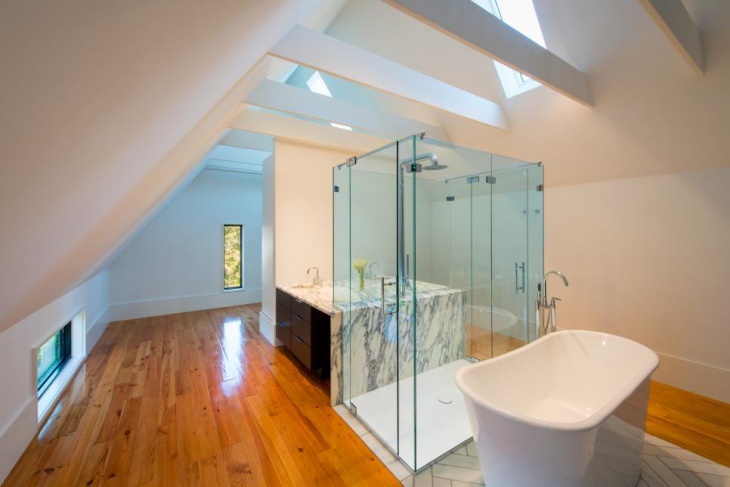 This traditional bathroom gets the classic character from the hardwood laminate flooring. The wide planks of laminate with the wood grains bring a natural feeling to the room that completes the look. This is suitable for city apartment bathrooms. Laminate can imitate stone tiles too. 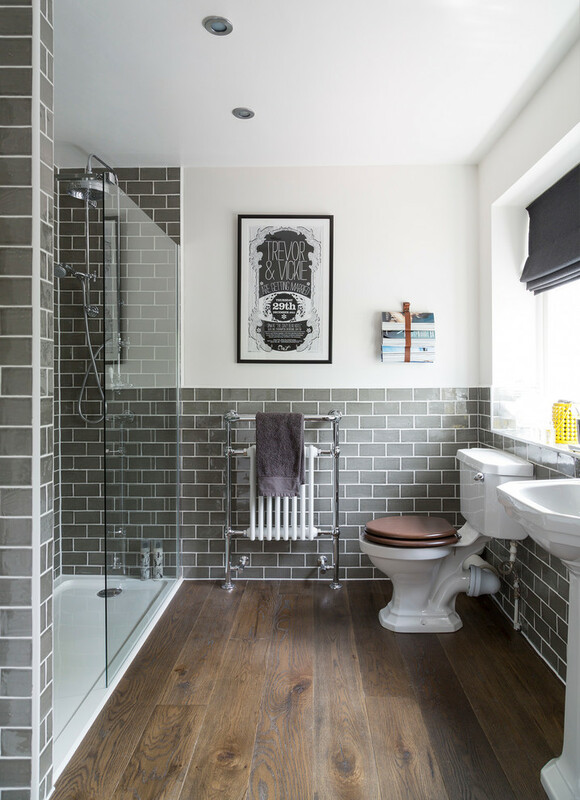 The contemporary style of this bathroom is matched with the white-grey limestone laminate tiles that blend with the dark furniture. This is suitable for apartments with long and narrow bathrooms. 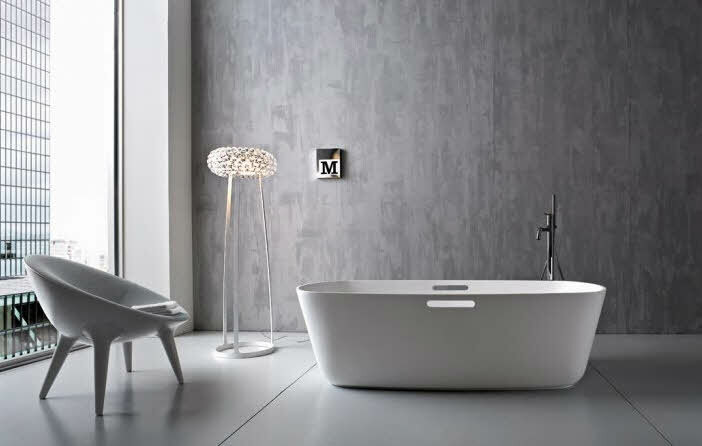 Marble is an elegant choice for your bathroom. Choosing laminate marble tiles though will give you the same look from the glossy surface with a warmer feeling. This can also be recreated to resemble Italian flooring for your cottage. Slate floors can be recreated with laminate tiles. 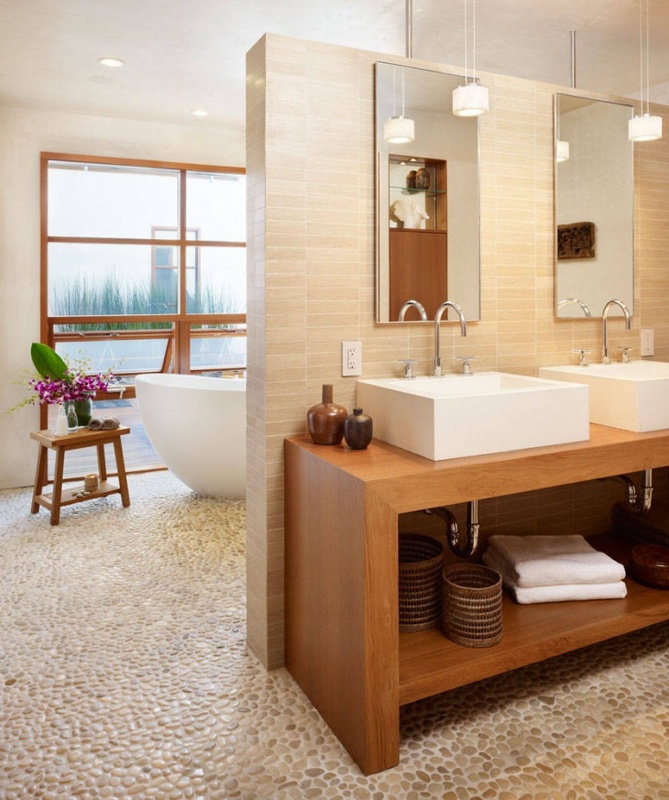 You can use laminate for the same effect and style your bathroom with stylish and charming flooring. 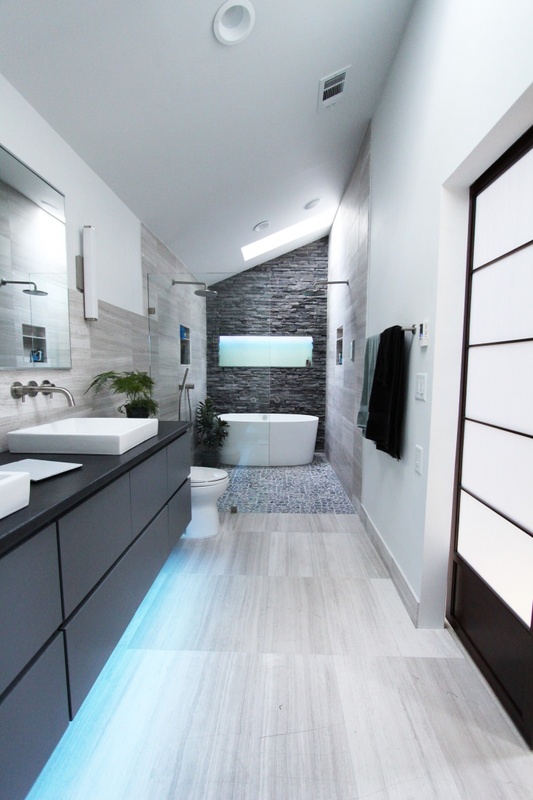 Like this contemporary bathroom, the slate gives a classic tone to the general look. 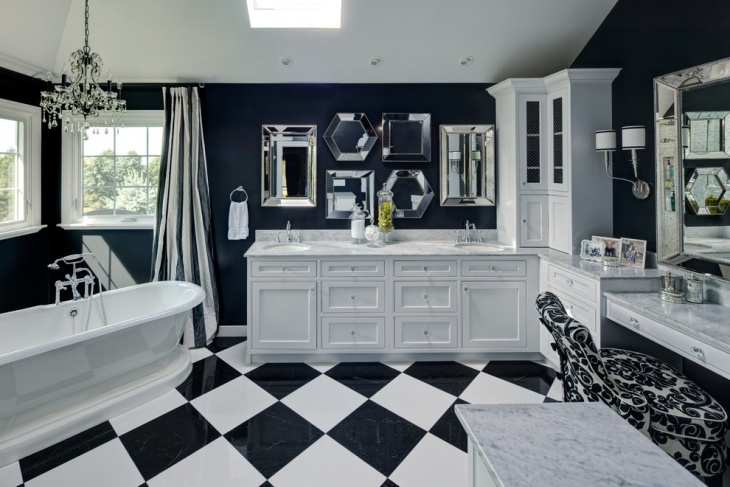 Another classic choice in bathroom flooring is vinyl. The laminate version of vinyl will give you easier maintenance without missing the beautiful look of vinyl. 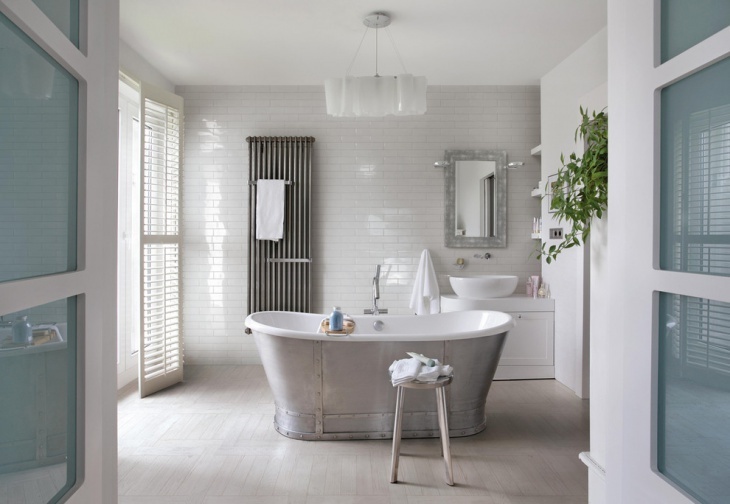 A light grey color will be a good choice for an off white bathroom. 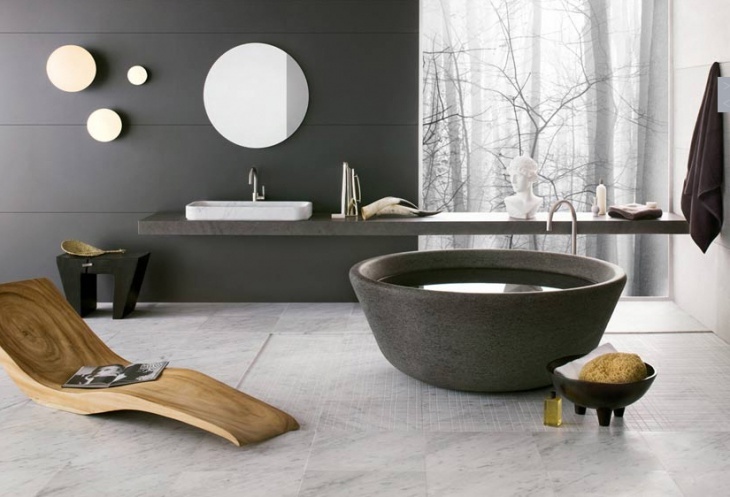 For a more dramatic effect in your bathroom, you can choose black laminate tiles. This will add a strong dose of elegance with a mix of drama for your bathroom. You can choose other dark colors like grey or blue. You can have a pebbled effect on your floor with laminate flooring. 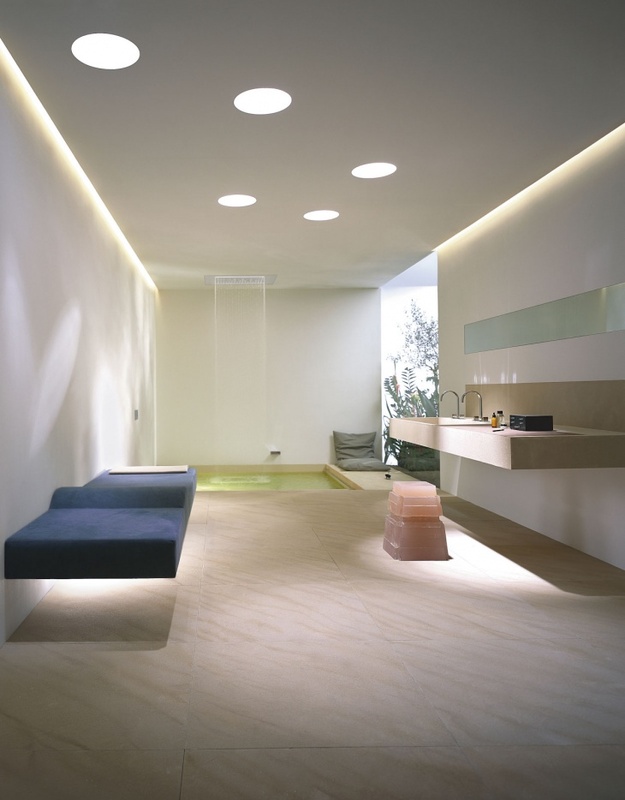 The effect will be the same and will give the same tropical style in your bathroom. You can follow the room’s color scheme and choose a shade lighter. 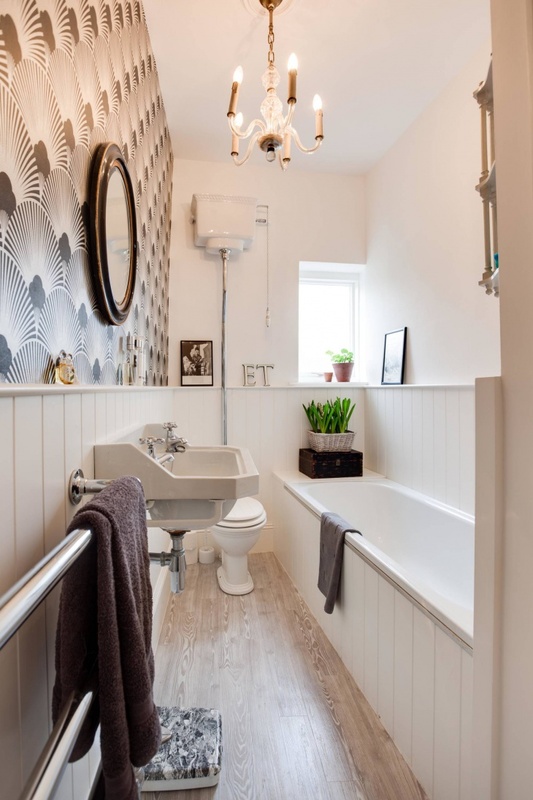 For a small bathroom changing the flooring will give the needed change. A wood imitation with laminate tiles in a worn out grey color will give a vintage look to your bathroom. This is great for small renovations in bathrooms. The shine of the stained floorboards can be achieved with laminate tiles too. You can get the same strength in sparkle without having to worry about the maintenance of your wooden floors. 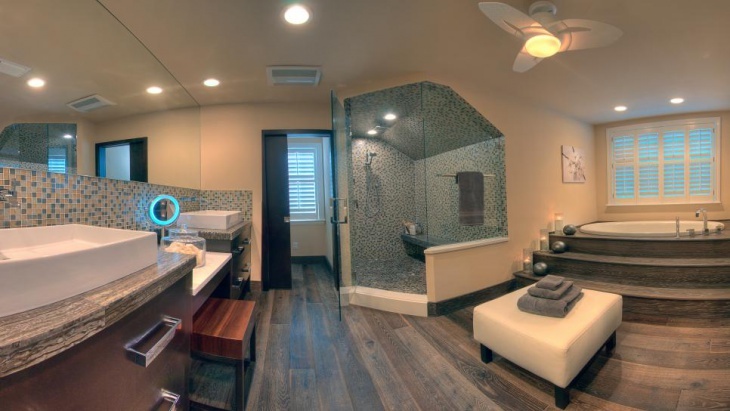 Style your bathroom with a more convenient and easy way. 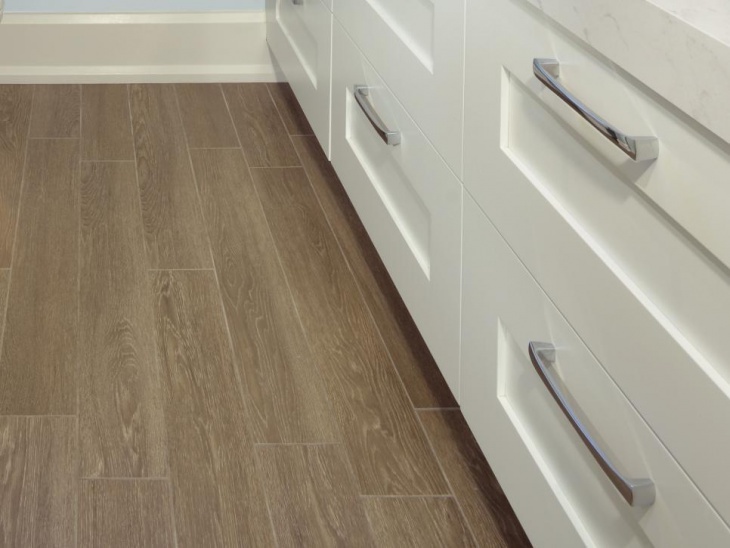 Laminate tiles are easier to install and have less maintenance requirements than the natural materials. 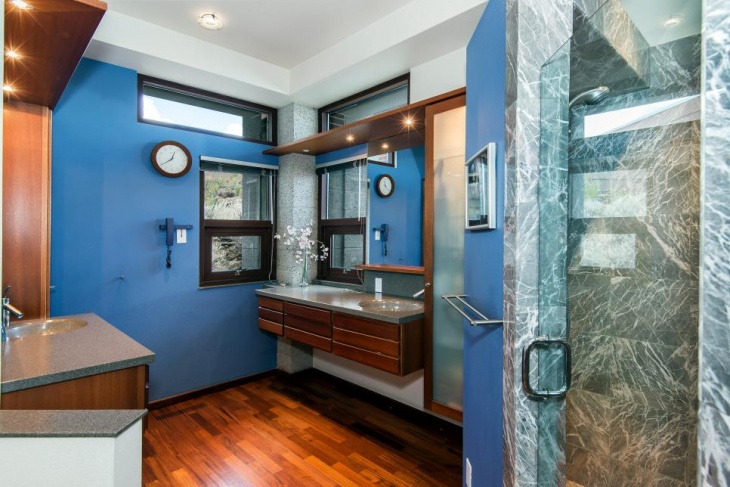 You can imitate any material, from classic marble to bamboo flooring with less expensive option that will remodel and style your bathroom in no time.